For traditional schools, the College/Career Indicator measures the percentage of students in a 4 year cohort of graduates who are prepared for college and career. For alternative (DASS) schools (see below), the measure uses the one year graduate cohort. Status is measured as the percentage of the cohort graduates who meet the criteria to be considered prepared. Basically, students are considered to be prepared if they fulfill any one of the possible combinations in the box on the right. Factors that are included are college course credits, Pathway completion, A-G completion, AP/IB exam scores, meeting or exceeding standards on the SBAC assessment in 11th grade, graduating with the state seal of biliteracy and the completion of military leadership training (such as via Junior Reserve Officer Training Corps). The final two criteria were added in the Fall 2018 release. Status data for the Fall 2018 release are from cohort graduates in the 2017-18 school year. Change is measured as the difference in the result between the most recent year of data and the prior year result. As of Fall 2017, only data for status were available for the College/Career Indicator. That means that no color or change results were presented. As of Fall 2018, both status and change results are available, note however that in order for an alternative school to receive a performance (color) rating for this measure, they must have had DASS status in both 2016-17 and 2017-18. To see the breakdown of what % and # of students achieved 'prepared' status via the different combinations of criteria for this measure for a school, search for the school on this website. Alternative schools here refer to schools that participate in the Dashboard Alternative School Status (DASS) Program. DASS schools include the following types of schools (Ed code Section 52052(g)): Continuation, County or District Community Day, Opportunity, County Community, Juvenile Court, California Education Authority Division of Juvenile Justice, and County-run special education schools. Any district-operated special education school with 70% or more students in grades three through eight and grade eleven who participate in the California Alternate Assessments (CAA) are also automatically placed into DASS. Alternative schools that serve high-risk students may also be eligible for DASS participation. In order to fulfill the college course credit criteria, a student must pass a college level course with a C- or better. Physical education courses do not count. Academic and CTE courses are all included, and students do not need to take the courses in sequence. In order to qualify, the student must receive college credit of some amount for the course (the amount does not matter). College course credit information is submitted to the state via each LEA's CALPADS submission, so ensuring that students are properly flagged as completing a dual enrollment course in the LEA's student information system is essential to ensuring schools get credit for the work of their student body. In order to count as prepared via CTE pathway completion, a student must finish a sequence of pathway courses totaling at least 300 hours and complete a capstone course with a C- or better. Students can get credit for completing the pathway at any point during high school. Students who fail to meet the capstone or hour requirement are not included. 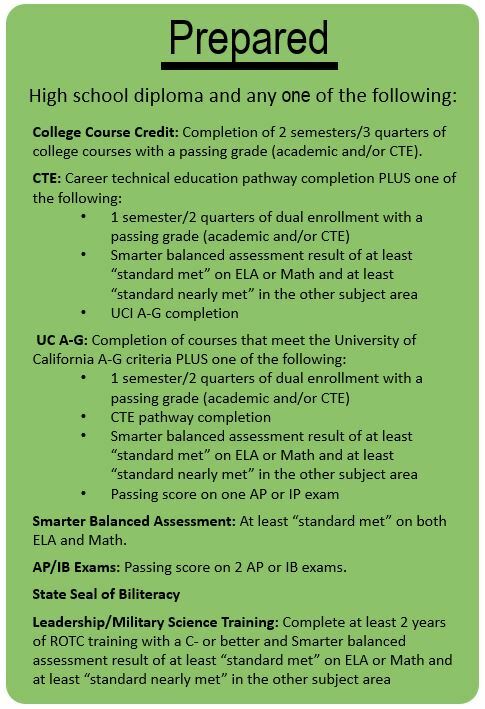 In addition to completing the CTE pathway, the student must also meet one of the following: A) one semester of dual enrollment with a C- or better in an academic/CTE subject, or B) standard met or better on one of SBAC ELA or Math and standard nearly met or better on the other. D) passing score on one AP or IB exam. In order to meet the A-G requirement, students must complete a set of courses that meet the UC or CSU A-G criteria with a C- or better. Like is the case for dual enrollment, these data are submitted to the CDE via a CALPADS A-G completion flag in the student record. To meet the SBAC criteria for prepared, a student must meet or exceed standards on both ELA and Math. A student's SBAC result could also be included as fulfilling one component of the UC A-G completion criterion, if the score on one test falls above the minimum score needed to nearly meet standards and the score on the other test meets or exceeds standards. To meet the AP/IB criteria for prepared, a student must pass two or more exams, either AP or IB. Advanced Placement (AP) exams are offered in 38 different subject areas. A score of 3 or higher is considered passing. In order to fulfill the AP criterion, a student only needs to take and pass any AP test with a 3 or better. The student does not need to take the course associated with that test. International Baccalaureate (IB) exams are offered in 6 different subject areas. A score of 4 or higher is considered passing. In order to fulfill this criterion, a student must pass with a score of 4 or higher. In order to receive the state seal of biliteracy, students must demonstrate proficiency in speaking, reading, and writing in one or more languages other than English. To meet this criterion for preparedness, students must earn the seal as well as score at least standard met on ELA and standard nearly met on Math. To achieve 'approaching prepared', students must achieve at least standard met on the SBAC ELA. In ROTC training, students complete physical conditioning programs aimed at promoting military values and precision in group activities. The training may also relate information from other subject areas to skills and knowledge relevant to a military setting. Students meet this criterion by completing at least two years of ROTC training and standard met in ELA or Math and standard nearly met in the other subject area. To achieve 'approaching prepared', students must complete two years of ROTC training (no SBAC requirement). SBAC results come from the testing vendor. AP exam results come from the college board. IB exam results come from IB. Pathway completion data come from CALPADS - the student career technical education (SCTE) file. A-G completion data also come from CALPADS via the UC/CSU indicator. More information on the specifics of the CALPADS files used are available in this pdf from the CDE. A memo from the CDE regarding the use of the one year graduation cohort for alternative schools can be viewed here.